The event features a marching contingent of the Greater Victoria Police Pipe Band, 11 (Victoria) Field Ambulance, 39 Service Battalion Detachment Victoria and the 3005 Royal Canadian Army Cadet Corps. Military vehicles from the LGen E. C. Ashton Armoury Ashton Museum will be on display along Vernon Avenue. The Reynolds Secondary School band will provide music accompaniment throughout the ceremony. 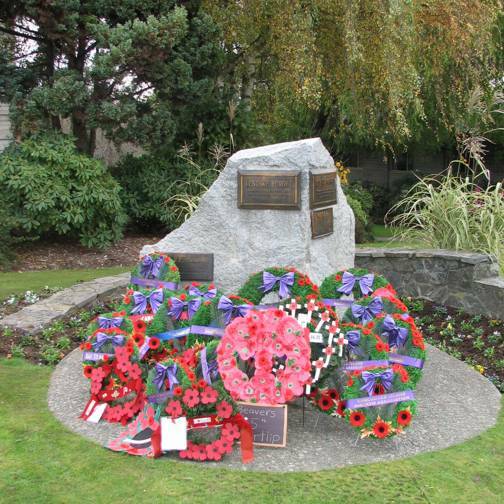 The Remembrance Day Ceremony will begin at the Cenotaph at 10:50 am and will include 2 minutes of silence at 11:00 am, a flypast, and wreath laying. The ceremony will end with a March Past & Salute followed by light refreshments in the Saanich Hall. Every year on November 11 Canadians pause in a silent moment of remembrance for the men and women who have served, and continue to serve, our country during times of war, conflict and peace. More than 1,500,000 Canadians have served our country in this way, and more than 100,000 have died. They died for us, for their homes and families and friends, for a collection of traditions they cherished and a future they believed in; they died for Canada. They gave their lives and their futures so that we may live in peace. If your organization would like to lay a wreath during the ceremony and would like to be listed in the event program please contact the event coordinator Rob Phillips by email no later than Friday, November 1, 2019.